The oldest black cabs are to removed from London's roads under measures to improve air quality. 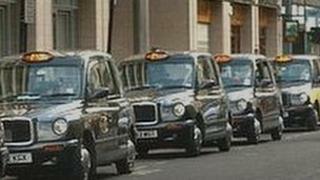 From 1 January 2012 licences will not be issued for Hackney carriages that are more than 15 years old. It is part of the mayor's air quality strategy, Clearing London's Air, and is expected to affect about 1,200 taxis. The Licensed Taxi Drivers Association (LTDA) welcomed the move but critics said the strategy was a "half-baked plan that doesn't do the job". According to the mayor's office road traffic is responsible for about 80% of airborne pollution in central London, with black cabs contributing 20% of this. London Assembly Green Party member Darren Johnson accused London Mayor Boris Johnson of taking backwards steps. He urged him to act urgently and introduce road pricing, the "proper inspection" of black cabs, and a "very low emission zone" to target vehicles in central London. The mayor's proposal is expected to reduce airborne PM10 emissions in central London by around 13% by 2011 and by about a third by 2015, compared to 2008. A LTDA spokesman said the policy targeting old black cabs was a "good compromise between bringing the improvements we all want and avoiding the serious financial hardship that the 10 year age limit, supported by Darren Johnson and the Green Party, would have inflicted on the taxi trade". As well as the restrictions on old cabs, all black cabs will be required to undergo two full MOT tests instead of the current annual check. And new cab drivers will also have to undertake an eco-driving course, which teaches efficient driving to reduce costs as well as emissions from January 2012. The mayor and Transport for London (TfL) have also announced a £1m fund to encourage taxi owners to upgrade to low emission vehicles such as electric black cabs. Details of the fund will be made available next year.